The ‘flows of angel hair’ that we refer to as Cirrus clouds are the best formations for revealing the movements of the wind. But when it comes to the wind direction, some Cirrus clouds can be rather misleading. They can make it look as if the wind is blowing in the opposite direction to the way it actually is. 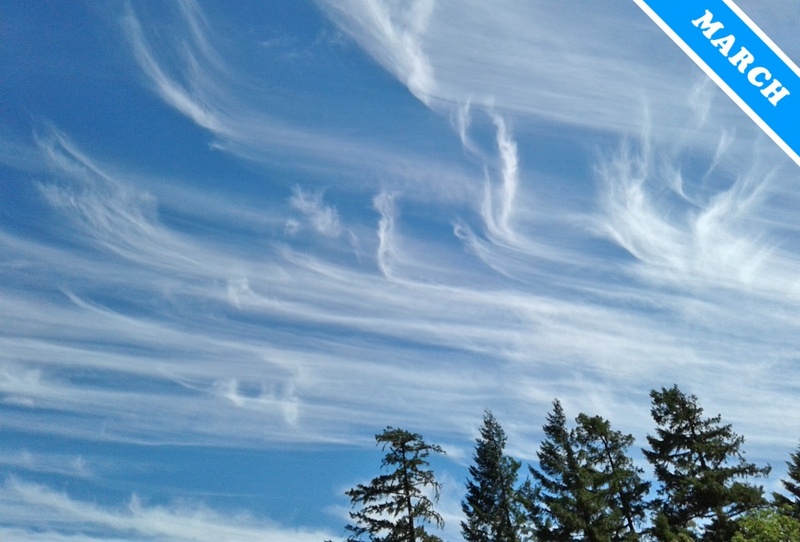 Take these Cirrus uncinus clouds, spotted by Laura Wiecek (Member 46,581) over Willits, California, United States. Do they give the impression to you that the wind is blowing from left to right across Laura’s photograph? The Cirrus are of the species uncinus, named from the Latin for ‘hooked’ because the streaks of falling ice crystals look at one end like hockey stick scoops or walking-stick handles. And while it may look at first glance that the wind is blowing from left to right, it is in fact blowing from right to left. The illusion is explained partly by the effect of ‘wind shear’. This is when the wind speed varies with altitude. The abrupt hooks of Cirrus uncinus result from strong wind shear. The other important factor is that wind speeds tend to be faster the higher you go. The hooked ends of the streaks are the upper parts of the Cirrus, where the ice crystals of these clouds start to fall. Up there, the wind is blowing very fast towards the left, and as the ice crystals descend, they pass into winds still blowing to the left but suddenly at a much slower rate. This sudden decrease in speed with altitude means the crystals trail further and further behind with their descent. The overall drift of the Cirrus clouds is only apparent when you watch them over time. Cirrus uncinus are the ‘mares’ tails’ that mariners of old read as signals to make ‘tall ships carry low sails’. This is because the strong wind shear that makes the Cirrus look like this often precedes the arrival of a weather front. Cirrus uncinus spotted over Willits, California, US by Laura Wiecek (Member 46,581). I learned those were called “mares’ tales,” seen in spring and they signify a change in the weather. Any part of that true?